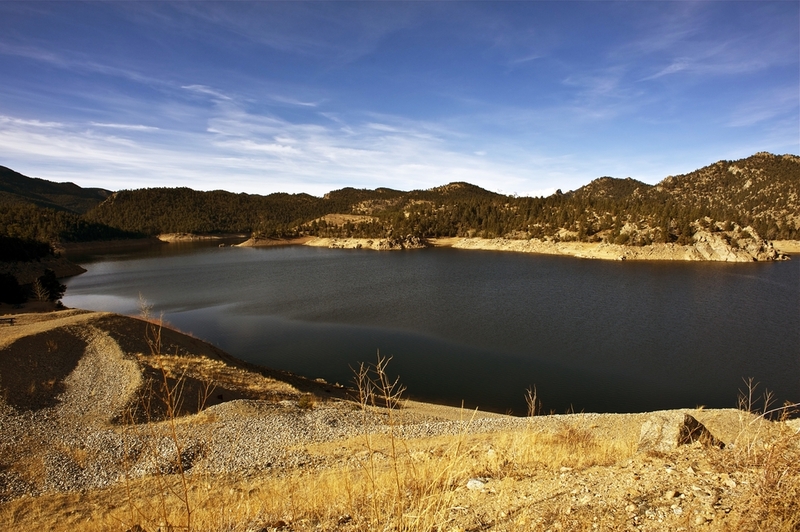 Gross Reservoir, 35 kilometers (22 miles) northwest of downtown Denver, stores water from the Colorado River Basin that is diverted in a tunnel through the Rocky Mountains. A water manager in Kansas proposes a pipeline from the Missouri River to Denver and other cities along Colorado’s Front Range. Click image to enlarge. Last December, the federal Bureau of Reclamation published a landmark study of water supply and demand in the Colorado River Basin. Included as a supply option was a pipeline from the Missouri River in Kansas to Colorado’s Front Range. Neither Kansas nor the Front Range, a string of cities east of the Continental Divide, lies within the natural boundaries of the Colorado River, which flows west out of the Rocky Mountains. As it turns out, the man who proposed the pipeline does not live in the river’s watershed either. Yet all three — Kansas, the Front Range, and the pipeline advocate — are connected by Colorado River water. That connection is the wonder and the marvel and the madness of the American West, a region whose diverse economies and ecosystems are linked by concrete and steel conduits that move water beyond borders. None of these water bodies is the logical end of the line for the Colorado River, whose natural terminus is a delta at the northern crook of the Gulf of California. A delta that is, ironically, all dried up. “It’s a reuse project, really,” said Kaufman, who serves on Kansas governor Sam Brownback’s Missouri River advisory committee. Kansas: Interstate Highways and Interstate Waterways? Clipping Wings or Taking Flight? Kaufman may be tilting at water pipes here. The cost is enough to clip the pipeline’s wings, especially when the federal government is shying away from investing in these types of projects unless they involve tribal water settlements. Just as daunting are the interstate political and permitting mazes. But we should still pay attention to these ideas. Conservation and reuse are the dominant narratives today and most cities still have significant improvements to make, but Big Infrastructure is not going away, as I’ll soon report for Circle of Blue. The projects being built, however, are a lot smaller than what Kaufman proposes and do not cross state lines. Do you live in either the Missouri or Colorado river basin? What do you think about this plan? Let me know directly at Brett Walton’s page or on Twitter @waltonwater or by commenting below. I think they concept makes great sense. By supplying Missouri River water to the front range you can drastically reduce dependence on trans-mountain diversions from the Colorado River. The diversions can be used as a cheap redundant source (since the infrastructure is already in place) to supplement Front Range demand in times the Missouri River pipeline is down or in times of drought conditions impacting the Missouri River, when the Rockies tend to see greater snowfall amounts. Conservation will only go so far. A alternate supply of raw water is necessary in order to sustain growth and protect against periodic or extended periods of drought. In addition, de-sal along the Pacific coast will be instrumental in bolstering the supply of raw water to western states. A multi-state plan should be studied that provides a long-term solution to providing water supply redundancy to serve states west of the Mississippi. The longer we wait the more expensive the project becomes to construct and anyone that thinks a long term solution is conservation is vastly mistaken.